Delve into the rich history of Spain on a 2-day tour of Granada and Toledo, two of the country’s most historically rich cities. Depart from Costa del Sol and travel by comfortable, air-conditioned vehicle through the spectacular scenery of the Sierra Nevada Mountains on your way to Madrid. 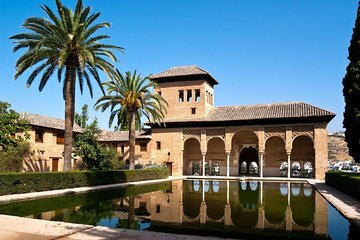 Stop to discover the Moorish heritage of Granada during a tour of the UNESCO-listed Alhambra and explore the medieval myriad of Toledo, a fortified city perched on a hill overlooking the Tagus River, during a guided sightseeing tour. One night’s accommodation in a 3- or 4-star hotel is included, as well as all entrance fees, transportation to Madrid, selected meals and a professional guide. Departure from Costa del Sol in the morning to Granada. Visit of Alhambra and Generalife Gardens, the last stronghold of the Moorish Kingdoms up to 1492, an amazing monumental environment is waiting for us. In the afternoon proceed to Granada for dinner and overnight. Breakfast and departure towards the Imperial City of Toledo (World Heritage city), where all the cultures and eras of Spain (Christians, Moorish and Jewish) have lived together. Afterwards, an impressive tour of the most important city monuments and products, like the famous 'Damasquinado' (gold and silver inlaying in iron). Tour concludes on arrival in Madrid. The hotels detailed above are as a reference only and are subject to change.